This document describes functionality only available if you have taken control over a Toolkit configuration. Please refer to the Shotgun Integrations User Guide for details. 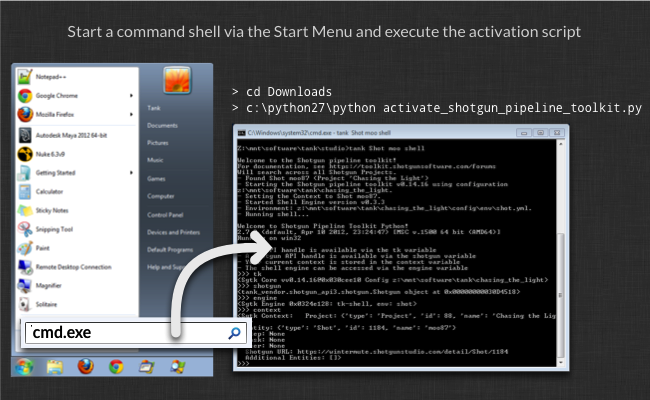 Prior to the Shotgun Desktop was released, Toolkit was installed and set up via a command line script. If you for some reason still would like to use this legacy process rather than our new and official UI based process, this document outlines how. It's still a bit technical! Step 2. Make sure the Toolkit is enabled! This document describes how you install and configure your first setup of the Shotgun Pipeline Toolkit using the command line based activation script. Note! For most use cases, we strongly recommend that you use the Shotgun Desktop to activate Toolkit. This document outlines the command line based setup workflow that was used before the Shotgun Desktop was released. If for some reason the Shotgun Desktop isn't suitable to use to get started, the steps outlined below may be useful. Python v2.6 or later (but not v3.x) installed. Please note that installing the Shotgun Toolkit is still currently a bit technical, requiring work on the command line and manual editing of config files. Our target audience is pipeline developers. Total installation time should be 20 minutes or so if you use our default configurations. The first thing to do is to activate the Shotgun Pipeline Toolkit. Once you have activated the Toolkit, you will be able to set up Shotgun projects with the Toolkit, install apps for them, etc. This first activation step includes a couple of different things: Installing the Core Pipeline Toolkit API on your machine, tweaking some settings inside of Shotgun and installing the Shotgun Browser plugin which acts as a bridge between Shotgun running in your Browser and the Toolkit and the various application where the Toolkit is running. Does your Shotgun site address end with shotgunstudio.com? In that case, congratulations! You should be all set and your site has already been prepared for the Toolkit Setup! Please continue to Step 2. If not, please drop us a line on our support site - it is possible that your site has not yet been fully prepared for Toolkit and the Shotgun team may need to go in and do some small adjustments before you can get going! The project data root /mnt/projects - this is where all the production data for all projects will be stored. This includes things like maya scenes, renders, Nuke scripts, images. Before proceeding, make sure that this folder exists on disk. 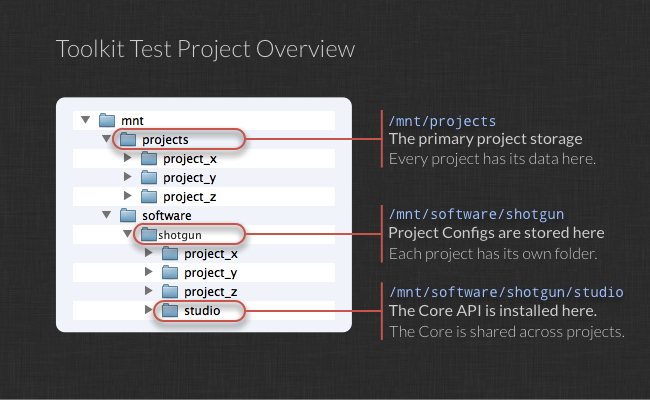 The studio root /mnt/software/shotgun/studio - this contains the installation of the Shotgun Pipeline Toolkit core API. 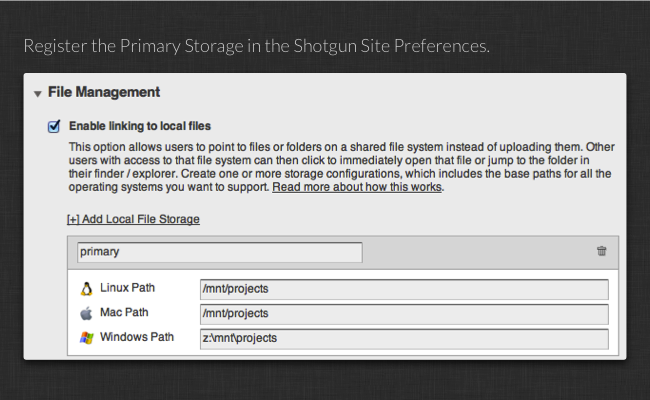 Configurations inside of /mnt/software/shotgun - there is one configuration folder for each project. Before proceeding, make sure that this folder exists on disk. Note that you don't need to use the locations outlined above - it is entirely up to you to decide where things should go on disk and the installation process will prompt you for all file locations. The rest of this document, however, will assume that you are using the locations shown above. If you are running on Windows, we recommend that you can use the same setup, but with the drive letter prefix (e.g. c:\mnt\projects or z:\mnt\projects). The next step is to create an API Script inside of Shotgun. This script will be used by the Pipeline Toolkit whenever it needs to communicate with Shotgun. The activation script will ask for this when it establishes a connection to your Shotgun server. When Shotgun creates a new API Script, it generates a random authentication key which is needed whenever you use it. The Pipeline Toolkit activation script will ask for this script key as part of the installation process, so now is a good time to navigate to the API Script detail page and copy that value to the clipboard. This primary storage is required by the standard configuration which we suggest that you start your Toolkit evaluation with. Later on, when you are setting up your own studio configuration, you can change and redefine this, even create a config that uses more than a single storage - this is handy if you for example have your textures, renders, work files etc on different mount points or drive letters. Now click Save to save your changes. You are all set! 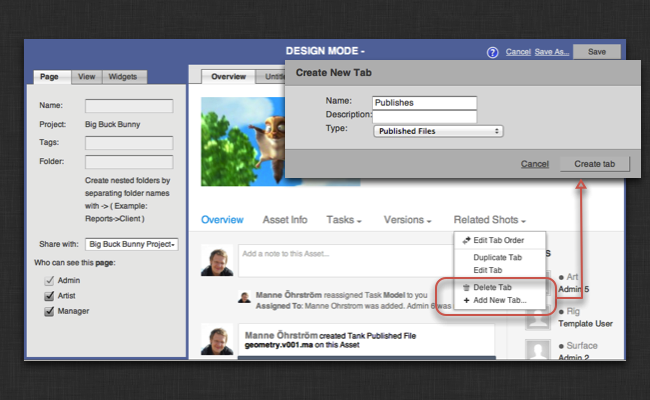 If you make changes to your layouts, don't forget to save the page afterwards! 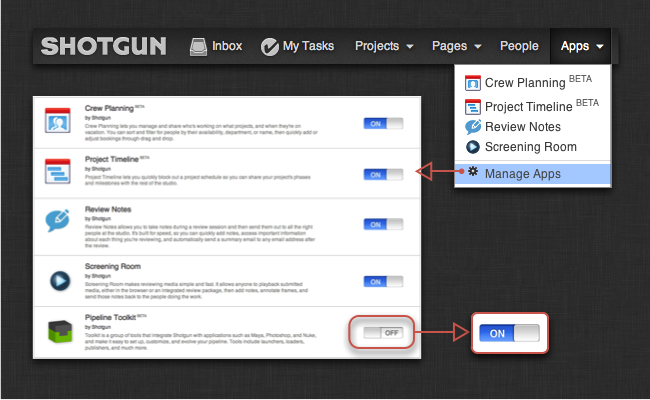 Previously we relied on a Java Applet to manage the communication between Shotgun and the Toolkit. You can still use Java, and if you don't install the Browser plugin, Shotgun will automatically fall back on the Java Applet. Note however that this has been scheduled to become deprecated and we strongly recommend that you use the browser plugin which is faster and more reliable. Now you are all set to get started! 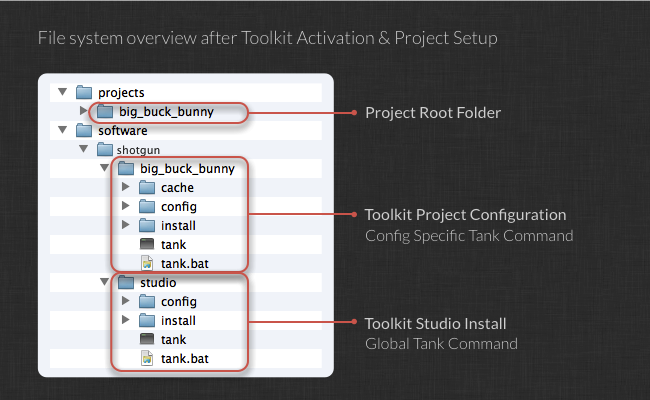 It is time to download and run the Pipeline Toolkit Activation Script. This script is a little python script that you run from the command line. 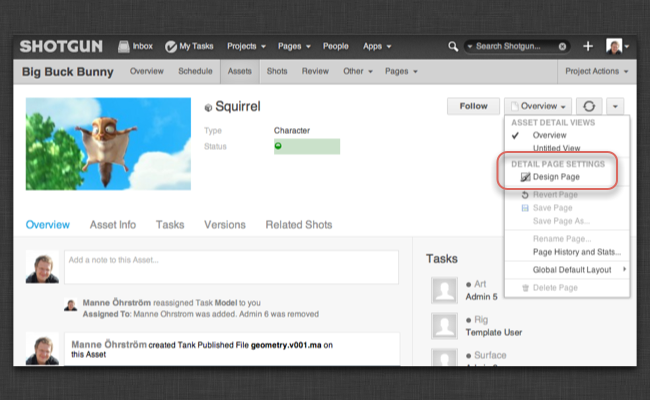 It will set up the basic folder structure on disk and download the Shotgun Pipeline Toolkit API from the App Store. Click to download the Shotgun Pipeline Toolkit activation package. Before downloading the activation package, we ask you to read through and accept the Shotgun terms of service below. By using the Shotgun Platform, including Toolkit, Screening Room or any other plugin or application ("Service"), all services of Shotgun Software, Inc. ("Shotgun"), you ("Customer", "You" or "Your") agree to be bound by the following terms and conditions ("Terms of Service"). Any new features that augment or enhance the Service, including the release of new tools and resources, shall be subject to the Terms of Service. You understand that Service may contain bugs. You understand and accept that there are risks involved in using Service and that managing these risks are your responsibility. exercise a reasonable degree of care in protecting the Service from unauthorized use. Your use rights under these Terms of Service shall terminate at the end of the Evaluation Period. If You do not elect to purchase the Service from Shotgun after Evaluation Period, all of Your obligations under these Terms of Service shall terminate, except for those relating to the protection of Shotgun's intellectual property, including trade secrets, which shall constitute a continuing obligation. In the event that You neglect or fail to perform or observe any of Your obligations under these Terms of Service, Shotgun may immediately terminate Service and all user rights granted hereunder. The Service and all proprietary information and title relating thereto, including but not limited to patents, patent applications, copyrights, trademarks, trade secrets, and accompanying documentation shall remain the property of Shotgun. You are responsible for maintaining the security of your account and password. Shotgun cannot and will not be liable for any loss or damage from your failure to comply with this security obligation. Violation of any of these Terms of Services will result in the termination of your Account. You agree to use the Service at your own risk. Payment is required in advance on a monthly basis (excluding Evaluation Periods). Other payment offers may be made by Shotgun, including a discount for advance payment of multiple future periods. All fees are exclusive of taxes, levies, or duties imposed by taxing authorities. The Service offered by Shotgun does not include any tangible goods, nor is Service ever delivered by means of any tangible media. You are solely responsible for properly canceling your paid account. For paid accounts and free evaluations, if you wish to preserve your content, you are solely responsible for exporting / archiving such content from the Service to your local storage media, prior to cancellation or end of evaluation. All of your Content will be deleted from the Service after cancellation or the end of an evaluation. Shotgun, in its sole discretion, has the right to suspend or terminate your account and refuse any and all current or future use of the Service, or any other Shotgun service, for any reason at any time, with two weeks notice. Upon expiry of the two week notice period of the Service will result in the deactivation or deletion of your Account and its content. You may cancel Service at any time from your billing and accounts center, found at https://shotgunsoftware.com/accounts or by giving notice to Shotgun. Shotgun will reimburse you for unexpired portions of any period(s) for which you have paid in advance, and you will not be charged again. Shotgun reserves the right to improve, add, modify or discontinue certain features or parts of Service, temporarily or permanently. Shotgun will make reasonable efforts to give advance warning of any significant changes. Customers that are self-hosted may elect to not be updated to the latest version, or upon request may 'roll back' to a previous version, always provided that the previous version is still supported. Prices of Service are subject to change. Shotgun shall not be liable to you or to any third party for any modification, price change, suspension or discontinuance of Service. Our support team will try to exceed your expectations. You can submit a support request at any time. We will respond as soon as we can, usually within a day or less. If the issue is critical, put 'URGENT' in the subject and we'll fast-track it to the top of the queue and get back to you within the hour. Our official support hours are 9am to 6pm PST, but we do our best to respond even outside of those hours. Each Sunday morning at 5:00AM GMT, the Service will be unavailable during a maintenance window which usually lasts 5-10 minutes, but on occasion longer periods may be required. In all cases, we'll keep it as short as possible. Our uptime approaches 99.99% on most months, and we're working to make this even better! We claim no intellectual property rights over the material or content you use in connection with the Service. Your profile and content uploaded or entered by you remain yours. However, you agree that ideas, suggestions, and/or feature requests that pertain the Service ("Feedback") shall be owned by Shotgun and shall be the sole property of Shotgun, with Shotgun having the right to obtain and hold in its own name all intellectual property rights in and to such Feedback. The computer code, documentation, visual design and "look and feel" of the Service are property of Shotgun Software Inc., copyright 2006-Present. All rights reserved. Shotgun Software (R) is a Registered Trademark. You may not duplicate, copy, or reuse any portion of any of these elements without express written permission from Shotgun. If You contribute any software code, documentation, and/or other materials to Shotgun ("Contributions"), You agree that by doing so you assign all rights, interest, and title to Shotgun; and Shotgun agrees to grant You a non-exclusive right to continue to modify and use Your Contributions for Your non-commercial or internal business purposes. You agree to only give Contributions of which you are the sole copyright holder and owner. You acknowledge that Shotgun may elect to distribute the Contributions on any basis, including under any proprietary or open-source licensing terms. You agree that if you have or acquire any patent or other intellectual property interest dominating Contributions, such dominating interest will not be used to undermine the effect of the assignment set forth above. Accordingly, Shotgun and licensees are licensed to make, use, sell, distribute, and otherwise exploit Contributions and their future versions and derivative works without royalty or limitation. This provision will be binding on Your assignees and/or successors. Technical support is only provided to paying account holders or authorized evaluation users. If the application is hosted by Customer, Customer agrees to use Shotgun's secure Virtual Private Networking (VPN) connection. This connection will allow Shotgun personnel to access the server in order to perform support, maintenance, and upgrades. You understand that Shotgun uses third party vendors and hosting partners to provide the necessary hardware, software, networking, and related technology required to run the Service. You must not modify, adapt or hack the Service or modify another website so as to falsely imply that it is associated with the Service, Shotgun, or any other Shotgun service or product. You agree not to reproduce, duplicate, copy, sell, resell or exploit any portion of the Service, use of the Service, or access to the Service without the express written permission by Shotgun. And Shotgun agrees not to duplicate, reproduce, copy, sell, resell, license or exploit any of your content in any way in whole or in part whatsoever, except for duplications of data in connection with backup and recovery procedures. We may, (but have no obligation to), upon reasonable notice, remove Content and Accounts containing Content that we determine in our sole discretion are unlawful, or violates any party's intellectual property or these Terms of Service. Verbal, physical, written or other abuse (including threats of abuse or retribution) of any Shotgun customer, employee, member, or officer will result in immediate termination of Service. You understand that the technical processing and transmission of the Service, including your Content, may be transferred unencrypted and involve (a.) transmissions over various networks; and (b.) changes to conform and adapt to technical requirements of connecting networks or devices. You must not knowingly upload any content which contains any worms or viruses or any code of a destructive nature. In severe/extreme cases of abnormal bandwidth use, we reserve the right to throttle your file or image hosting until you can reduce your bandwidth consumption. Shotgun does not warrant that (a.) the Service will meet your specific requirements, (b.) the Service will be uninterrupted, timely, secure, or error-free, (c.) the results that may be obtained from the use of the Service will be accurate or reliable, (d.) the quality of any products, services, information, or other material purchased or obtained by you through the Service will meet your expectations, and (e.) any errors in the Service will be corrected. Both Parties (You and Shotgun) expressly understand and agree that the other shall not be liable for any direct, indirect, incidental, special, consequential or exemplary damages, including but not limited to, damages for loss of profits, goodwill, use, data or other intangible losses (even if party has been advised of the possibility of such damages), resulting from: (a.) the use or the inability to use the Service; (b.) the cost of procurement of substitute goods and services resulting from any goods, data, information or services purchased or obtained or messages received or transactions entered into through or from the Service; (c.) unauthorized access to or alteration of your transmissions or data; (d.) statements or conduct of any third party on the Service; (e.) termination of Service; or (f.) any other matter relating to the Service. Both Parties agree that the total aggregate liability to the other for damages in connection with Service or any other materials provided hereunder, regardless of the form action giving rise to such liability (under any theory, whether in contract, tort, statutory or otherwise) shall not exceed the aggregate fees paid by Customer to Shotgun. The failure of Shotgun or you to exercise or enforce any right or provision of the Terms of Service shall not constitute a waiver of such right or provision. The Terms of Service constitutes the entire agreement between you and Shotgun and govern your use of the Service, superceding any prior agreements between you and Shotgun (including, but not limited to, any prior versions of the Terms of Service). Questions about the Terms of Service should be sent to accounts@shotgunsoftware.com. Reservation of Rights. Except as otherwise expressly provided herein, nothing in these Terms of Service shall be deemed to grant either party, directly or by implication, estoppel or otherwise, any right or license with respect to any technology or other intellectual property rights, and each party retains all right, title and interest in and to their respective technologies and other intellectual property rights. Confidentiality. By virtue of these Terms of Service, the parties may have access to information that is confidential to one another (Confidential Information). For purposes of these Terms of Service, Confidential Information of a party means information, ideas, materials or other subject matter of such party, whether disclosed orally, in writing or otherwise, that is provided under circumstances reasonably indicating that it is confidential or proprietary. Confidential Information includes, without limitation, the terms and conditions of these Terms of Service; all business plans, technical information or data, product ideas, methodologies, calculation algorithms and analytical routines; and all personnel, customer, contracts and financial information or materials disclosed or otherwise provided by such party (Disclosing Party) to the other party (Receiving Party). Confidential Information does not include that which (a) is already in the Receiving Party's possession at the time of disclosure to the Receiving Party, (b) is or becomes part of public knowledge other than as a result of any action or inaction of the Receiving Party, (c) is obtained by the Receiving Party from an unrelated third party without a duty of confidentiality, or (d) is independently developed by the Receiving Party. Without limiting the generality of, and notwithstanding the exclusions described in, the foregoing, Confidential Information of Shotgun includes the Service, including any portion thereof (in both object code and source code form), and the Feedback, and any modifications and derivatives to the Service and Feedback, and any information or materials derived there from, whether or not marked as such. Restrictions on Use. The Receiving Party shall not use Confidential Information of the Disclosing Party for any purpose other than in furtherance of these Terms of Service and the activities described herein. The Receiving Party shall not disclose Confidential Information of the Disclosing Party to any third parties except as otherwise permitted hereunder. The Receiving Party may disclose Confidential Information of the Disclosing Party only to those employees or consultants who have a need to know such Confidential Information and who are bound to retain the confidentiality thereof under provisions (including, without limitation, provisions relating to nonuse and nondisclosure) no less restrictive than those required by the Receiving Party for its own Confidential Information. The Receiving Party shall maintain Confidential Information of the Disclosing Party with at least the same degree of care it uses to protect its own proprietary information of a similar nature or sensitivity, but no less than reasonable care under the circumstances. Each party shall advise the other party in writing of any misappropriation or misuse of Confidential Information of the other party of which the notifying party becomes aware. Exclusions. Notwithstanding the foregoing, these Terms of Service shall not prevent the Receiving Party from disclosing Confidential Information of the Disclosing Party to the extent required by a judicial order or other legal obligation, provided that, in such event, the Receiving Party shall promptly notify the Disclosing Party to allow intervention (and shall cooperate with the Disclosing Party at the Disclosing Party's sole cost and expense) to contest or minimize the scope of the disclosure (including application for a protective order). Further, each party may disclose the terms and conditions of these Terms of Service: (a) as required by the applicable securities laws, including, without limitation, requirements to file a copy of these Terms of Service (redacted to the extent reasonably permitted by applicable law) or to disclose information regarding the provisions hereof or performance hereunder to applicable regulatory authorities; (b) in confidence, to legal counsel; (c) in confidence, to accountants, banks, and financing sources and their advisors; and (d) in connection with the enforcement of these Terms of Service or any rights hereunder. Source Code. With respect to any source code provided by Shotgun to Customer, such source code shall be subject to all of the obligations of these Terms of Service including the following additional restrictions on use and disclosure: (a) Customer shall allow use of or access to the source code only by employees or contractors of Customer who have a need to use the source code for exercise of Customers rights with respect to the source code as set forth in these Terms of Service, and who are bound to retain the confidentiality thereof under written non-disclosure agreements that include provisions (including, without limitation, provisions relating to nonuse and nondisclosure) no less restrictive than those required under these Terms of Service; (b) Customer shall maintain and use the source code only in secure, locked facilities to which access is limited to the employees or contractors set forth in subsection (a) above; (c) for source code that is useable or stored on any computer equipment (whether a multi-user system, network, stand-alone computer or otherwise), the equipment must have password-based access control, with each user having a unique user identification and associated password; (d) Customer shall use, and shall allow use of and access to, the source code only at its facilities; and (e) Customer shall maintain a record of all personnel who use or have access to the source code, the number of copies made, if any, of the source code, and the computer equipment and storage media on which the source code is used or stored. Equitable Relief. Each party (as Receiving Party) acknowledges that the Disclosing Party considers its Confidential Information to contain trade secrets of the Disclosing Party and that any unauthorized use or disclosure of such information would cause the Disclosing Party irreparable harm for which remedies at law would be inadequate. Accordingly, each party (as Receiving Party) acknowledges and agrees that the Disclosing Party will be entitled, in addition to any other remedies available to it at law or in equity, to the issuance of injunctive relief, without bond, enjoining any breach or threatened breach of the Receiving Party's obligations hereunder with respect to the Confidential Information of the Disclosing Party, and such further relief as any court of competent jurisdiction may deem just and proper. Severability of any provision of these Terms of Service is held by a court of competent jurisdiction to be unenforceable for any reason, the remaining provisions hereof and thereof shall be unaffected and remain in full force and effect. Governing Law. These Terms of Service are to be construed in accordance with and governed by the internal laws of the State of California without giving effect to any choice of law rule that would cause the application of the laws of any jurisdiction other than the internal laws of the State of California to the rights and duties of the parties. These Terms of Service shall not be governed by the U.N. Convention on Contracts for the International Sale of Goods, the application of which is expressly excluded. Disputes. If, at any time during the term of these Terms of Service, the parties have a disagreement, dispute, controversy or claim arising out of or relating to the interpretation or performance of these Terms of Service, or the alleged breach thereof (a Dispute), the parties shall in good faith attempt to resolve such Dispute. Any discussions between the parties in an effort to settle such Dispute shall be treated as compromise and settlement negotiations. If the parties cannot resolve the Dispute within thirty (30) days from the date on which the parties first met (either in person or by phone) as part of their good faith efforts to resolve such Dispute, such Dispute shall be submitted to a single arbitrator under the rules of the American Arbitration Association's Commercial Arbitration Rules and Procedures, as amended by the terms of these Terms of Service. The arbitration shall take place in the County of Los Angeles, State of California. The costs of the arbitration, including the fees and expenses of the arbitrator, shall be shared equally by the parties. The arbitration shall be conducted in strict confidence. The arbitrator's decision shall be based upon the substantive law of the State of California (exclusive of its choice of law principles) or applicable federal law (including federal arbitration law), in accordance with these Terms of Service. The arbitrator's decision shall follow the plain meaning of the relevant documents and shall be final and binding. The award may be confirmed and enforced in any court of competent jurisdiction. The arbitrator's power to award damages shall be limited by the terms of these Terms of Service. Indemnification. Each party (the Indemnitor) shall indemnify, defend and hold harmless the other party and its respective directors, officers, employees, agents and representatives (collectively, the Indemnitee) from any loss, liability, damage, award, settlement, judgment, fee, cost or expense arising out of or relating to any third-party claim, action, suit or proceeding that Indemnitor has breached these Terms of Service or its representations, warranties and covenants hereunder. Marketing and Promotions. Shotgun may, upon the prior approval of Customer (such approval not to be unreasonably withheld), use Customers name and a general description of the services that Shotgun provides to Customer for marketing purposes (including in connection with a list of Shotguns customers and for a case study highlighting Shotguns services). Shotgun shall obtain the Customer's prior written approval of any such materials prior to release. Remedies. All rights and remedies hereunder shall be cumulative, may be exercised singularly or concurrently and, unless otherwise stated herein, shall not be deemed exclusive. Force Majeure. Both parties shall be excused from performance under these Terms of Service and any related Statement of Work for any period to the extent that a party is prevented from performing any obligation, in whole or in part, as a result of causes beyond its reasonable control and without its negligent or willful misconduct, including, without limitation, acts of God, natural disasters, war or other hostilities, labor disputes, civil disturbances, governmental acts, orders or regulations, third party nonperformance, or failures or fluctuations in electrical power, heat, light, air conditioning or telecommunications equipment. Construction. The captions and section and paragraph headings used in these Terms of Service are inserted for convenience only and shall not affect the meaning or interpretation of these Terms of Service. Relationship of Parties. These Terms of Service shall not be construed as creating an agency, partnership, joint venture or any other form of association, for tax purposes or otherwise, between the parties, and the parties shall at all times be and remain independent contractors. Except as expressly agreed by the parties in writing, neither party shall have any right or authority, express or implied, to assume or create any obligation of any kind, or to make any representation or warranty, on behalf of the other party or to bind the other party in any respect whatsoever. Any notice required to be given to the hereunder, unless otherwise stated herein, shall be in writing and served upon the receiving party at their respective addresses herein stated (or to such addresses as they or either of them may hereafter designate) by facsimile, prepaid first class mail, courier service or by personal delivery thereof and shall be deemed to have arrived a) on day in respect of personal delivery; b) within forty eight hours of posting an inland letter and within six days of posting an overseas letter whether or not the letter enclosing the notice be actually delivered returned or otherwise: and c) in the case of facsimile, on the day of transmission provided such transmission occurs prior to 17:00 hours at local time of the recipient otherwise it shall be deemed received the following working day of the recipient. The activation script will start executing. It will prompt you for information at various points and once complete, you will be all set to create your first Pipeline Toolkit project! If your studio is using a proxy server to connect to the Internet, the activation script (and further Toolkit operations) may not function correctly. In this case, you can specify a special --sg-proxy parameter when you run the activation script. For more information about this, run the activation script with a --help parameter. Activation is now complete! Congratulations! We recommend that you follow the advice given by the activation script, and add the main installation folder to your PATH environment variable, so that you can access the tank command wherever you are. 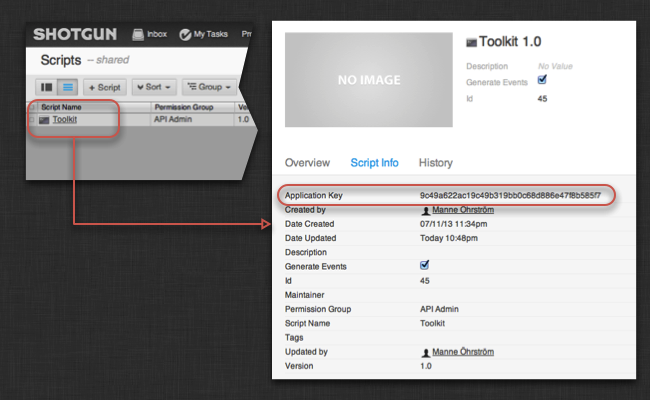 Now, you can just type tank anywhere in a shell to access toolkit. The next step in this document is to set up a project to use with the Shotgun Pipeline Toolkit. Keep reading for details on how to do that. 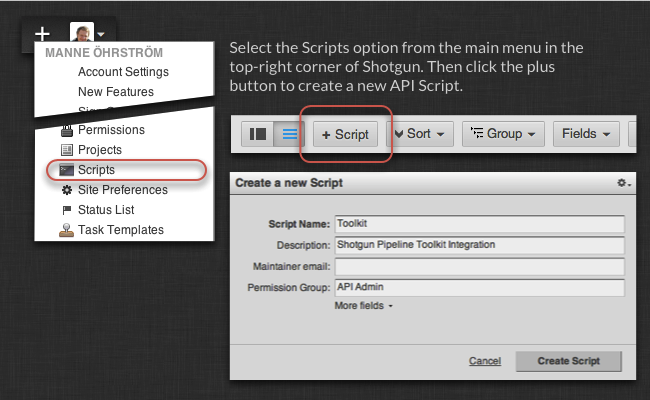 Once you have activated Shotgun Pipeline Toolkit, it is time to create your first Project. This is straight forward - you run a setup_project command which will take an existing project in Shotgun and extend it into the File System. The process starts by asking for a configuration template to use. This configuration contains all the settings for which apps and engines to use, how the file system should be structured and how the configuration should change across departments. For your very first setup, we suggest you use our default configuration which contains an up to date mix of apps and engines. For the future, however, we recommend that you let your pipeline configuration evolve by simply choosing a configuration from an existing project. This way, any configuration changes and improvements you make to a project will benefit not just that project, but all future projects! This command will set up a new project and do all the things you need in order to run the Toolkit for that project. For this example setup, you should be able to simply accept the defaults that the project setup script suggests. You can usually do this by hitting ENTER when prompted for information. Note that each configuration area gets its own tank command. This is useful later when you want to create a staging or development sandbox for a project and want to run things from there rather than from the main project configuration. Now you have installed the Shotgun Pipeline Toolkit and set up your first project, your test bed is ready, so let the experimentation and exploration begin! But before you get started, to see it all in action, we recommend spening a couple of minutes checking out our various walkthrough videos. These show the Shotgun Pipeline Toolkit in action, how it works inside applications such as Maya and Nuke. It also goes through basic concepts such as publishing, version control, loading etc. We also have a more technical document that goes through the high level concepts in the Shotgun Pipeline Toolkit and explains 'bigger picture' things. Once you have a good grasp of what the Toolkit does out of the box, we recommend that you move on to this document to get a deeper undestanding of how the Toolkit could be adjusted to suit your particular studio needs. > An introduction to the high level concepts in the Shotgun Pipeline Toolkit. If you have any questions, do not hesitate to contact us! Just submit a ticket. At step 2, the Pipeline Toolkit is not there at all. Any idea?